Update: This is now official, with a letter posted on Primera Air’s website. We’ve written extensively about Primera Air, which has launched transatlantic flights within the past few months. The airline has had an unusual growth strategy (which James wrote about in great detail in the post linked above), and they seem to just be throwing darts and seeing what sticks, as they’ve announced transatlantic flights between so many city pairs, despite their small size. They’ve also already canceled several routes. Well, it looks like the airline was growing too quickly without proper financing, and it’s now being reported that Primera Air will be filing for bankruptcy (and ceasing operations) in the coming hours. This is according to a leaked email being circulated, which was written to employees by Primera Air’s Director of Flight Operations. Reasons I am sure are many but very high cost for the aircrraft with corrosion last year as well as the delays of our new Airbuses lead to too high costs for wet lease and cancellations which in the end became too much for the airlines. Our owner was working on securing financing but was not able to in the end. This is what was stated during today’s staff meeting in the Riga office. All the staff in the Riga office have been informed but official information will not be sent out until midnight by our owner. I understand it is difficult but please keep this to yourself if you can until after the official notification from the owner. In fact, I am not even authorized to send this email I think it is the right thing to do for all of you out there on the line. You deserve to know. Unfortunately I can’t say I’m surprised here. With the pace at which the airline was growing they were surely in a cash bind. Not only have they struggled with their low yields and load factors, but they’ve also had serious issues with actually taking delivery of planes, which has wreaked havoc on their operations. So many times we hear stories of how startup airlines are running out of cash, yet somehow they almost always seem to find a way to get new financing. This isn’t one of those cases… at least it’s not looking like it. I suppose it’s possible they’ll somehow secure financing in the eleventh hour, though I wouldn’t count on it. 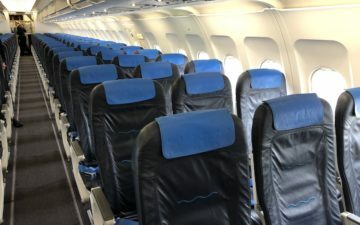 If you’re scheduled to fly on Primera Air in the future, I’d recommend looking at other options. Are you surprised to see Primera Air allegedly filing for bankruptcy? wow recently took this flight from london to newark. I requested to have my prepaid meal (which I did not get served on flight) refunded! Umm… the writer asked you to keep this to yourself until official notification from the owner tonight, and you post it on the blog? I find it sad. These LCC’s really disrupted the market and brought down fares considerably. At this point, all seem to be in trouble… Norwegian also cutting routes, etc. I hope they make it somehow! I know a pilot working there who lost his job when Monarch Airlines went insolvent exactly a year ago tomorrow morning. Strategy and management issues aside, I feel for the staff and crew of Primera. @ Mitch – This email is already circulating around the entire industry – the “original” recipients were Primera Air staff, which Lucky (based solely on the tone of the post) isn’t part of. So yes, there’s that one person, that one Primera Air staff out there who snitched on the writer to the entire airline industry, but that person wasn’t Lucky. The airline industry is very competitive, capital intensive, has high and unpredictable costs (labor, fuel), is heavily regulated. In addition, it is difficult to differentiate your product, and most airlines compete on price. Why are so many people attempting to start airlines? I have 2 booked flights with them. Any idea on how this works regarding refunds? The irony is that on the website Jason linked above, right next to the message on Ceasing Operations, is their announcement of new routes to Madrid and Frankfurt at an attractive rate less than a month ago. Could all the new route announcements recently be them hoping to get bookings so that they could stay afloat? Free loans to finance themselves for a bit. Just a theory. Recommend changing title from WOW to Oh! Wow is the name of a low cost airline. I had a transatlantic flight cancelled by them at the last-minute. I got the fare refunded (luckily) a few weeks ago, but never got the EU flight reimbursement. Guess I never will. Is it just me, or is this notification also full of loads of spelling mistakes and grammatical errors? Someone couldn’t be bothered to use spell check? Well, yes, and horrible news for people stranded now! It’s good to be ambitious, but I think they should have waited abit longer, received their planes and roosted them on local charters before long haul launch. Especially given the engine issues with the A320neo family they should have allowed for some buffering. This doesn’t come as much of a suprise given that they had One way transatlantic fares of €63 or sth. If you have booked with Primera and used a credit card to pay the fare, I suggest contacting the card issuer and asking if they will issue you a refund. Friends were able to do this successfully with airberlin tickets when they went bankrupt. My friend has a ticket booked with them tommorow…..
My mother us set to fly with them tomorrow morning 2nd of October from Gothenburg to Southern Italy , guess that will not happen …. I used that airline on two occasions to travel from Newark to Stansted. Very cheap operation. The second time the flight was canceled without any notice. Had to put people in hotel until next day. There were some people in line commenting about the operations and bankruptcy was coming. Sad to see them go because other airlines to Stansted from Newark is nonexistent. I just got to IAD and they canceled the flight. They didn’t notify me in advance and there is no one here to get me rebooted. What are my options to get back to Stansted? As noted already, may I suggest changing the headline. At first reading, I thought it was WOW airlines that was going belly up. Dulles has a note about this on their Facebook page. I recently did their STN-EWR flight in the new A321. Eight hours onboard a narrow-body aircraft, with no entertainment system or even a free cup of water, originally designed for short to medium-haul flights, is insane. It is basically eight hours of Ryanair. The end of cheap credit and oil prices going up will be bad news for a lot of airlines. Not surprised at all. One of these “low cost long haul” combos was going to go under sooner or later. WOW came within a few days a few weeks ago and just secured a $54m bond to keep flying (they wanted $100m) and so have enough to survive for around 18 months, all things remains equal. Norwegian had to sell assets and do a private stock placement in March to survive, and they’ll probably post a profit for Q3 to give them enough to at least survive the year and probably to March unless the economy tanks. So that left Primera. The question is, does Primera’s collapse take enough dirt cheap capacity out of the market for the others to survive? Maybe, but overall they were a very small fish. They may get a short term benefit as a result of those stranded needing the cheapest possible flights to get home, plus those who lost tickets and need to book again. A well known British journalist (Simon Calder) estimates uo to 5,000 stranded and up to 60,000 with lost tickets. If they do smart revenue management and offer fares “low enough” to secure those affected pax without completely dropping their pants on fares, they could be a short term beneficiary. The Elon Musk of airline’s – over promised and under delivered. Flew a few BHX services with wet lease antiques and then abandoned us. Good riddance. Still stuck here at IAD. There haven’t been any Primera staff anywhere and they’re not answering the phone. Can anyone help me get back to Stansted? I don’t want to spend another night here. Stranded in the Swamp – first seat you can get to LHR, Tube to Liverpool Street, Stansted Express train. Get to Boston and then buy 2 more flights? First seat to LHR? Are you nuts? United was asking $1700 for a seat and BA wanted even more. I don’t have those kind of funds. I paid £149 for the Primera ticket. Wow will do Baltimore to Stansted via KEF for £349 one way tomorrow at the time of posting. Otherwise it’s a long swim. Good luck.